Let me welcome you on behalf of the monastic community of Christ the King Priory. I thank you for coming. From our side we owe you a debt of gratitude. If you and the groups you represent do not come, there would be no St. Benedict Center. In reality, your coming here draws out the act of hospitality on the part of the community. You help us keep our Benedictine tradition of hospitality alive and well. In a short while some of you will offer testimonies of your experience here. Now for my part I offer a few reflections from our side, maybe a bit theoretical but foundational. As some of you might know, in his Rule St. Benedict has one chapter devoted to the topic of hospitality. Strictly speaking it is entitled: “The receiving of guests.” Those words in themselves are significant. Benedict begins this chapter with a quote from the Gospel of Matthew: “I was a stranger and you welcomed me” (Mt 25:35). Benedict situates the practice of hospitality in the context of scripture. It is more than just a one-line quote, however, it is a whole tradition of hospitality. I would like to begin my reflections by taking a look at that tradition. Perhaps the most famous scene of hospitality in the Hebrew Bible is that found in Genesis 18. There we read of Abraham welcoming three strangers who come to him at the noon hour. The description is quite detailed. He sees them and runs toward them; he bows down to the ground before them, a sign of honor; he is quick about having a meal prepared. He washes their feet and he himself serves them while they are seated under the shade of a tree. Three strangers appearing out of nowhere and Abraham and Sarah pull out the best for them. So we think that hospitality is making the stranger feel welcome and fed. And so it is. But the story continues. Before the three leave, the leader informs Abraham that he and Sarah will have a son by this time next year. The guests who seem to appear in the heat of the day needing refreshment and shade, or arrive empty handed, now are the bearer of a gift, a son to an old couple. Notice that the gift is not slight but actually the fulfillment of their hopes and dreams. What we find in this Abraham story is that the guest, the stranger, who comes off the road for a while, is the bearer of a gift. In some way the guest becomes the host. The openness of the reception and welcome bring forth a response. The one being served now serves the server. The hospitality has borne fruit, a child. A few weeks ago on Sunday we had the story of the prophet Elisha. A Shunemite woman offers him hospitality. The details are given: a little room with a bed a table, a chair and a lamp. Here she is offering a stranger and holy man space. After a while, Elisha says, what can we do for her? So Elisha is told of her need and he who is the honored guest now becomes the host and promises her a son. Once again, the host welcomes the guest…then the guest becomes the host offering the first host a gift. The Hebrew Bible has a clear tradition about the stranger living in the land. The Torah had some direct commands about the alien: “You shall not oppress or afflict a resident alien, for you were once aliens residing in the land of Egypt” (Ex 22.20); “You shall not oppress a resident alien; you well know how it feels to be an alien, since you were once aliens yourself in the land of Egypt”(Ex 23:9); “You shall treat the alien who resides with you no different that the natives born among you; you shall love the alien as yourself; for you too were once aliens in the land of Egypt. I the Lord, am your God” (Lev. 19:34). Deuteronomy seems to go further: “God mighty and awesome, who has no favorites…and loves the resident alien, giving them food and clothing. So you too should love the resident alien for that is what you were in the land of Egypt” (Dt 10:18). One immediate point we can take from these commands from the Torah is that being an alien, a stranger, an outsider is also part of the story of the host. God says, you can identify with the alien, and because you can identify, you will know how to receive. But it is not just knowing you were once Egypt, it is also remembering that you made a journey out of Egypt, you moved from being an alien, a stranger to one who belongs. We can all say that we are pilgrims, we are on a journey, and we have not yet arrived. When we stay in touch with our own pilgrimage, we can recognize others on pilgrimage. Benedict explicitly says that the poor and pilgrims are to receive special honor and care when they come knocking. A pilgrim may be someone on the road to a holy place, perhaps in Benedict’s day the holy places of Rome. But for us Christians we know that our whole life is a journey and pilgrimage. For those of us on the inside, Benedict calls it seeking God. That is his phrase for being on pilgrimage. When the stranger knocks, I should be able to recognize him/her because I know what it is like to be in a strange place and on the move…The commands of the Torah make us face our own past and present. We are still moving away from Egypt and need to rest on that journey out. We see something of the pilgrim and visitor in the life of Christ. Often times he is invited to join a meal, but we soon find that he acts the host—he breaks the bread and shares it. He brings salvation to Zacchaeus of Jericho. Zacchaeus invites Jesus but Jesus brings with him a change of heart for Zacchaeus’ honor is restored: he becomes again a son of Abraham. He who had been an outsider in his own town now belongs again. Think of the story in Luke 7 where a prominent Pharisee invites Jesus to dinner but then finds that a woman has entered and taken Jesus’ attention away from the host. But what Jesus does is become a host to the woman. Without condemnation, he accepts the woman’s hospitality and transforms it into forgiveness. He completes the hospitality that his original host was lacking. It is the Gospel of Luke that presents hospitality as a main framework for Jesus. Think of the Emmaus story where at the end of the journey the two disciples invite Jesus for the evening meal. The disciples invite the stranger who has become a good listener to share a table with them. But what happens. When the bread comes out, it is not they who break and share it but the stranger who picks up the bread, breaks and shares it. The stranger becomes the host and the two recognize that in this gesture of hospitality Jesus is present with them. The offer of hospitality becomes a moment of revelation, of seeing the truth about the other person. It is clear from Luke and John that Jesus had personal friends and was a guest in their home. We know of one such home, that of Martha, Mary and Lazarus. In Luke’s gospel there is that story of Martha and Mary offering hospitality to Jesus. Martha seems to be doing all that is associated with hospitality especially in preparing the food, etc. Interestingly, Jesus seems to say to Martha, you have it backwards. When I come are you really the host? Mary seems to have understood. She sees the guest as the host. So she sits at his feet to take it all in. In other words, Jesus the host is spreading out a table of the word and Mary is the guest sitting and waiting to be served the word. How many times do we hear Jesus say: I did not come to be served but to serve. In the Gospel of Luke, the whole program of Jesus may be described as one of hospitality. From the very beginning of the Gospel, Jesus is presented as the presence of God who has come visiting his people. What does old man Zachariah say when his son John is born: Blessed be the Lord, the God of Israel, he has come to visit his people and redeem them. Jesus is God visiting his people, visiting us. The question is, of course, if Jesus is God visiting, will we recognize him and welcome him into our homes? There is a sad scene in Luke’s Gospel. Jesus has finally arrived at Jerusalem. He has come up the hill and the city is spread out before him. One would think that he would be excited upon seeing the holy city. But he sits down and begins to cry. He knows that Jerusalem will fail to recognize its moment when its God has come to visit the city. The preconceptions, the false expectations, will not allow Jerusalem to become a host to the Visitor of the ages. But Jesus does not turn his back either. He is the guest who brings a gift and he will share that gift of himself and leave it for those who know the real nature of hospitality. In our Benedictine tradition of hospitality, we must always be aware that each visitor may be carrying more than we see at first glance. There may be a surprise as there was for Abraham and for Jerusalem and Martha and Mary. Later in the Christian tradition there are texts about hospitality, one reads: “Above all, let your love for one another be intense…be mutually hospitable to one another without grumbling. As each has received a gift, use it to serve one another as good stewards of God’s varied grace” (1 Pt 4:8–10). All this is background to the opening statement of Benedict: “All guests who present themselves are to be welcomed as Christ, for he himself will say: ‘I was a stranger and you welcomed me’” (Mt 25:35) (RB 53:1). Any talk of Benedictine hospitality has to begin with this statement. Benedict puts his whole chapter on the receiving of guests into this context. It is clear that what the Gospel of Luke saw as happening in Christ, namely God is visiting his people, Matthew now says that visit was not a past event. Christ continues to visit because he identifies himself with the stranger. His resurrection did not alienate him from the world but instead made him relate to all the world. Hence, his face can be seen in the poor, hungry, prisoner, alien and stranger. The God who loved the resident alien in the land has confirmed that love by having his Son identify with such. And since we are all pilgrims, that is, on a journey, Christ continues to visit us in the journey of others. Hospitality is surely about the room, the bed, a gracious welcome and food and drink. But for the Benedictine way it must also be a Christ event. Whether the guest, the visitor, the stranger knows that is not the point. It is the eyes of the one receiving that must be opened. It is how we, the host, look at the one standing at the entrance. Hospitality is concerned with what I the host, the receiver see. Do I see the Christ-stranger? Do I see the alien-Christ as one? My response to one who appears at the door is to be grounded in that understanding of what is happening. Seeing the guest as Christ is not foreign for those of us inside the Benedictine life. In his Rule, Benedict makes it clear that Christ is present in the community in at least two visible bodily ways. Note that for Benedict, Christ’s presence in the community is embodied, it is in real people. Christ has a face and can be encountered. In theological terms, there is a sacramentality to Christ’s presence in the community. One place Christ is encountered in the community is in the superior. He is the Christ figure in that he is meant to be a living symbol that this community is centered in Christ. Another bodily and tangible experience of Christ is in the sick. Benedict quotes from the same famous chapter 25 of Matthew:” I was sick and you visited me.” Visiting and caring for the sick become Christ events. In both of these cases, the Christ figure is inside the community. He is a member of the community; this makes it easier to understand the Christological dimension of the encounter. All are members of the body of Christ. The community with its superior and its sick members are all bound together in one way of life. With the guest it is different. The guest is precisely not a member of the group; the guest does not belong to the family in an intimate way. The guest is an outsider; he or she may not even know much about what the community is all about. The challenge then in the Benedictine way is to understand that the one who comes from the outside is also a Christ figure. For many of us inside the community, it is through the guest that we meet the outside world; interactions with the guest mean that the monk is touching the world out there in the flesh. Naturally, it touches us in social media and the news. But the physical encounter with one from ‘out there’ remains unique. In Benedictine hospitality, the receiving of guests is a place where worlds meet. It is clear that the monks don’t have the same life style and rhythm as the average Christian or human person. The description in Benedict’s Rule of how hospitality is to be done is in reality a description of how these worlds meet and interact. How do people and worlds that are different greet each other and for a while share something of each other’s lives? The theory and practicalities that Benedict spells out in his chapter on hospitality are meant to be a guide for this encounter. Benedict takes for granted that the worlds will meet. Benedict wants to draw a picture of how the outsider and the insider meet. But that is precisely what hospitality is. It is clear that on the part of the monk and those receiving or welcoming the visitor, they must stay in the Christ-centered mode. This will affect everything that they say or do. I say this is important for us because otherwise the hospitality center or St. Benedict Center will then go into the hotel/motel mode. And while a lot of the place may look like one, it is not that. The visitor does enter a different world. In the best sense, the visitor and the guest should enter a Christ- centered world but at the time he or she may not even know that. And that is OK. If all is going well, the guest should feel or know something deeply human, something authentic in the human spirit. For the one welcoming, the reception is a Christ one. For those of us in the sacramental tradition, we know very well that things, objects and persons can convey the holy, Christ himself, whether it be water, bread, wine, oil, or admittance of wrongs done. The material world we see is not all that material. So likewise, we say the human person is not all that secular and material. Being human has a divine, other quality about it. As the host, I am asked to see that in the one who comes to me. And for a Christian, I am asked to see the divine-human person of Christ in this stranger. Hospitality is sacramental event, an encounter with the Lord. An example from Benedict’s chapter might make this clear. There are a number of ritual gestures that Benedict has the guest and the host go through. But there is one where the whole community is involved. “The abbot shall pour water on the hands of the guests, and the abbot with the entire community shall wash their feet. After the washing they will recite this verse: ‘God, we have received your mercy in the midst of your temple’” (Ps 48:10) [RB53:12–14]. Notice how the psalm verse seems to focus on the reception of a guest as a reception of the mercy of God itself. The ritual of washing the guests’ feet is not done here at the Center. But it shows you the attitude and the value that the community needs to have toward the guests. I would suspect that the majority of St. Benedict’s guests were fellow Christians for whom this gesture would send them back to Jesus washing the feet of the disciple—a sign of love, respect and above all service. The guest would know that they are in gospel territory not just Nebraska territory. How we can convey the meaning of that gesture today, I have not figured out. But the hospitality of St. Benedict is based on faith in the divine presence encountered in the guest. I have seen some gestures in other cultures that may be related to this or have elements of this Jesus gesture: eg. In East Africa, when you enter a room, you shake hand with every person. And when you shake hands, the left hand is visible, places on top of the right forearm or under it. You are then invited to sit in the circle; you are not outside the circle. You can find out something about Benedictine hospitality in listening to the vocabulary Benedict uses in the Rule. One can then check that against one’s own vocabulary of hospitality. The vocabulary begins with the title of Benedict’s chapter. He does not say “On hospitality.” He puts it in an active way: “On receiving/welcoming guests.” Benedict speaks of ‘receiving’ or welcoming the guest. The word ‘receiving’ is deceptively simple. But designates right away an attitude of receptivity, of openness, of appreciation and of love (another word the RB uses when dealing with guests). This receptivity is found in the title of the chapter and a good number of times within it. Think of what you feel when you receive something or someone. The attitude is one of open hands, of the willingness to let the other person be who they are. There is that feeling of wanting the other person or persons to be there. Naturally, when we receive something from someone, we take in in hand in a careful way. The word receive has a tone of being given something beyond one’s control. If we think that it is Christ whom we are welcoming, then we naturally know that we have something precious at hand. The Rule says that when the guest is announced the brethren should “run to meet them” or at least hasten to meet them. The word is not usually translated so colorfully but it does convey the attitude that someone of importance has come. When I think of receiving something or someone, I see myself making room for them, allowing them to be present. The Latin word suscipere is rich in overtones; it can mean to take up, to take upon yourself, to take care of, to support. All this is used of the guest. Every Benedictine monk or sister knows this word. He/she sings it before God on profession day. Then it is a plea to be received and upheld by God. And during their life, they in turn are receiving others. It is my observation that when guests come here to the Center, they not only feel this reception, this welcome verbally, but they can feel it spatially as well. The architecture of the Center itself communicates receptivity. One can be held in the space here without being crushed or crowded or overwhelmed. In my short time here, I have heard a number of guests tell me what they feel in the house. It all comes down to feeling welcome, at home, and frequently, at peace. The space holds them and perhaps does not force them into being something they are not. No one has said they feel confined or shut in or closed in. I’m not sure what the artist had in mind when he sculptured the statue of St. Benedict across the lake. I think it distinct from other iconography of St. Benedict. But for one thing, Benedict’s arms are flung open; they are either a gesture of welcome to you the guest saying: come here, welcome. Or they are a plea saying, please receive me, accept me as I am. In either case, they are part of the suscipe, the receiving that is at the heart of a Benedictine hospitality. Even the word ‘guest’ is significant. In Latin the word is hospes from which our English word ‘hospitality’ is derived. It designates a stranger, someone coming from outside our group. The same word, however, can also be used for the host. The one who does the receiving and provides the welcome is the host. This is illustrated in the wonderful combination of first guest then host in the Jesus Emmaus story and that of Abraham and his three visitors. In the word ‘receive’ there is a sense in which the guest is bringing something, a gift perhaps that the host is to receive. Seen this way, the guest is the host offering the one who welcomes him or her something of significance. Benedictine hospitality allow that the guest is bringing something which is then received. And if Christ is in the guest, then the thing received is even better than what the host can offer. Seeing the guest as someone bringing a gift not so much as a thing but in the person themselves may not take place right away but there is definitely an openness to that. Any Benedictine who has been involved in community hospitality can tell you how a visitor or a guest can be an enrichment for the guest master and the community. Individual monks who have encountered guests over the years can testify to that. I can assure you that has happened here in the 20 years of St. Benedict Center. Benedict in the Rule chooses his words carefully when he wants to describe the attitude and behavior of the monk and community toward a guest. He uses expressions like “proper honor” should be shown, “the courtesy of love,” “humility” should be shown. He talks about “human kindness;” the Latin word is “humanitas,” this could include a meal. I like to also leave it more general to mean treat the guest humanly, the best of humanity. I would like to think that when a guest, visitor, the unknown person approaches the reception desk that the hostess treats them with all the humanity she has because she is able to see the humanity in the person standing before her. Generally speaking, the person is treated with respect as a human being and not just another live body that walked in the door, or worse, another customer or client. They are unique and that uniqueness is respected. Benedict also speaks about praying with the guest and exchanging a kiss of peace. Those guests who join the monastic community for our daily round of prayer can experience that part of Benedictine hospitality. The honor shown the guest has concrete gestures to go with it: a bow of the head or even a full prostration at the feet of the guest. Why? Because Christ is in the guest. The guest carries something of the divine with him or her. Benedictine hospitality will not stand for a split world or a world where there is no sacred. Our hospitality takes place in a whole world, where the divine and the profane are encountered together. It presupposes that world. And yet, and this is another facet of Benedictine hospitality, it will not demand that the guest who comes knows that world. The kindness, the honor shown to the guest will recognize the humanity of the other as it is. From my own experience of coming from a monastery that had a retreat house for 50 years, I had a chance to reflect on what it was that made it unique and why people came back. One thing I came to realize was that it ‘received,’ accepted people where they were in their life’s journey. The monks who worked with the retreatant-guests were accepting of them; there was no condemnation. A non-judgmental attitude prevailed. For a few days, these retreatants could be free to share who they were and they were listened to. We didn’t proselytize or rather we did but it was not by preaching but by the attitude of hospitality with kindness, acceptance, humility and just plain old good humanity. This was especially true for our guests who were in 12-step programs. In the 1950s, retreat houses were reluctant to accept recovering alcoholics for their weekend retreats. Somewhere we said yes and respected the anonymity of these men and women and their stories of broken and grace-filled lives and gave them hospitality. It was the old-timers in recovery that told me that others didn’t want us alcoholics but you took us in. Another important element in a retreat center like this is that there is a Benedictine community living here. Benedictine hospitality is communal hospitality. Being a small community you don’t see many of us but the fact remains there is a praying community that lives here. Yes, there is a large staff that help make this place happen, a staff that is indispensable to our ministry of hospitality and to whom we owe a debt of gratitude. You experience our way of hospitality through them. But it is because there is the monastic community here that it happens at all. Not all groups who come here know this or are practically affected by it. But those who know are aware that it gives this Center a special flavor. It is not just a place to come to for a few days and you leave. There are people living and praying and working here who don’t leave. If you come enough times, you can join them in that rhythm of prayer, you may meet them. Some of us are rather pleasant to get to know! The point is, guests and visitors come and go; the community remains and lives its Benedictine life. The first word in Benedict’s chapter on receiving guests or strangers is the word “all”. “Benedict writes that “All guests are to be received as Christ.” It may seem an insignificant word at first sight. But it is possible to make choices among guests or strangers. If someone I do not know comes knocking, I may modify the quality of my welcome or may not welcome him or her at all. But Benedict says all guest are to be welcomed and welcomed as Christ. Christ is present in all guests. 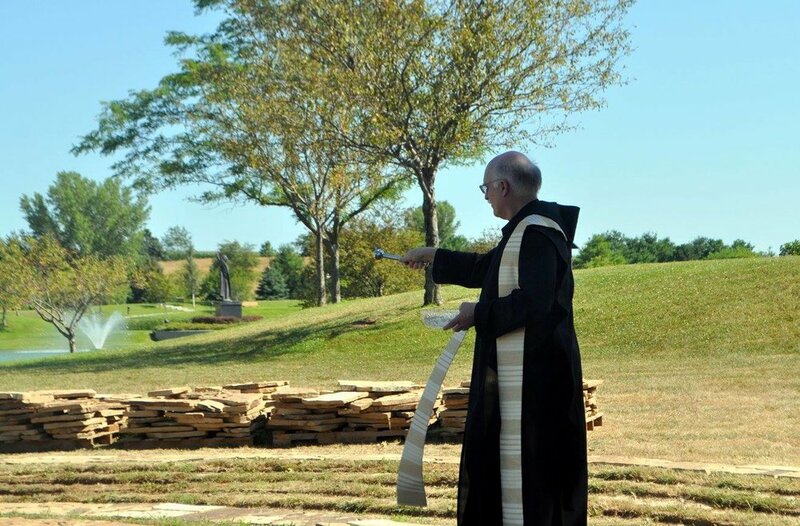 I mention this because the subtitle, so to speak, of St Benedict Center is an “ecumenical retreat center.” The word ecumenical is rooted in the word oikoumenikos meaning belonging to the world. This openness to all Christian denominations, and, I would say, and beyond, certainly takes St. Benedict’s “all guests” seriously. It is an important feature of the Center. It tries to carry out Benedict’s sense of ‘honoring’ everyone. Many different Christians have found in the Center a place where they can share and grow in their spiritual lives. Part of this is due to our ecumenical age, perhaps, and to the openness of people in the Heartland. But a part of that is also the prayer life of the monastic community here. Our communal life and hopefully our inner spirit as well is grounded in a spirituality that pre-dates any breakdown in the larger Christian oikoumenikos. You can come here and tap into something that is our common heritage. Perhaps, too, this oikoumenikos is an area of challenge for us: to continue to open ourselves up beyond our fellow Christians and those for whom God seems absent and keep fostering a welcome for those of other faith traditions knowing that there is a spirituality that binds us all as children of the one God who is gracious, merciful and kind. The Greek word for hospitality is philoxenia. It comes from the combination of two words xenos meaning stranger, alien, and philos meaning love. Put together one can say love of the stranger. It sounds vaguely familiar to what the Lord spoke to Moses in the Torah. We have not brought this word into English. But there is another word with xenos in it that we do use and that is xenophobia, the fear of the stranger. That word can be seen in print these days more and more. There are more displaced persons in the world than ever before in the history of humankind. We see thousands of people fleeing from homes in Africa and Asia looking for a new place to live. The reasons for this mass migration of peoples in various places on earth, including the Americas, are varied. Some are related to hunger, some to poverty and economic conditions, some to war and political strife. Some do not want to leave but are forced by these conditions. With the rise of these movements of people has come a growing xenophobia, a hostility toward someone different than I am/we are; someone who doesn’t speak my language, eat my food or wear clothes like me. The result is an increasing number of alienated and uprooted people who no longer have a home and a place where they are safe. In some places there is a fear of the other developing. As we all know, fear isolates and kills the human spirit. It is possible that Benedictine hospitality can help here, perhaps not in a physical, material way, but in a way of approach, an attitude toward the other. Based in its Judeo-Christian roots, our hospitality leans clearly on the side of honoring, loving, being human and kind to the stranger, the guest, the one from out there. And the mandate for us is clear: I was a stranger and you welcomed me. For us the Christian ministry of hospitality is no less than to see the face of Christ in all. We are not the only ones who think along these lines. A story: some years back when I was going to South India four times a year to accompany a small Benedictine community, one our brothers there and I went were on an outing to visit some cultural and historical sites. That afternoon we were visiting a former palace of one of the kings of Kerala that had been turned into a museum. When we parked the car, the brother said there is an admission fee. I said check and see if there is a special rate for foreigners. It is very common in some countries that there is one admission fee for the locals and other for foreigners. Naturally it is more expensive: 5 rupees for a local; 25 for the foreigner. So Brother went off. The ticket man could not see us from where we were parked. When Brother came back I asked him if he inquired about the fee for foreigners. He said, yes. The man, he reported, simply said: “There are no foreigners on earth.” The man was not a Christian, he was a Moslem.